Remove the steering column cover, and the instrument lower panel LH. Refer to IP-21, "Removal and Installation". Press the pawls (B) of the key interlock cable slider (A) while sliding it in the direction of the casing cap (C), and separate the adjusting holder (D) and slider. Remove the key interlock cable from the shift selector. Remove the key interlock cable from the key cylinder. Disengage the clip and disconnect the key interlock cable from the vehicle. Move the shift selector to P position. 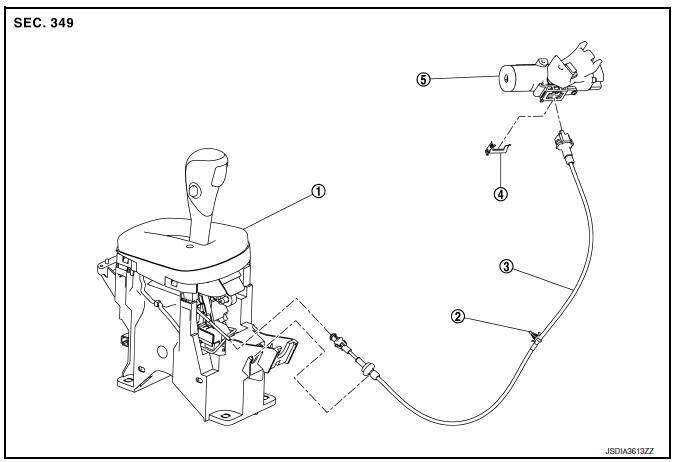 Turn the ignition switch to ACC or ON position. 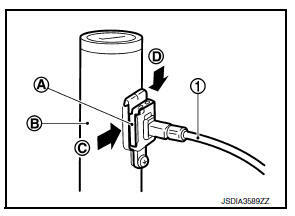 Install the holder of key interlock cable to key cylinder. Turn the ignition switch to LOCK position. 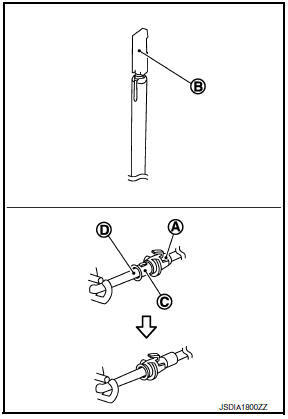 Install the adjusting holder (A) onto the key interlock rod (B), then install the casing cap (C) onto the shift selector cable bracket (D). When installing the key interlock cable, never bend or twist the cable forcefully. After connecting the key interlock cable to the shift selector cable bracket, be sure to check that the casing cap is completely fastened to the cable bracket. 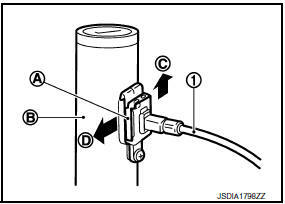 If the casing cap is easily displaced, replace the key interlock cable. 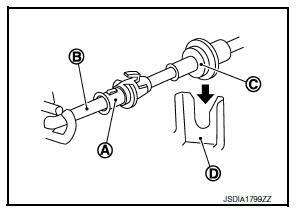 While pressing the detent rod (B) down, slide the key interlock cable slider (A) toward the key interlock rod (D) side and install the adjusting holder (C) and key interlock rod. Do not squeeze the pawls on the key interlock cable slider when holding the slider. Do not apply force in a perpendicular direction to the key interlock rod when sliding the slider. Install the center console assembly. Refer to IP-17, "Removal and Installation". Install the steering column cover, and the instrument lower panel LH. Refer to IP-21, "Removal and Installation". Check the CVT position. 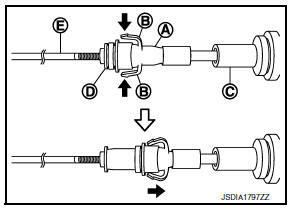 If a malfunction is found, adjust the CVT position. Refer to TM-150, "Adjustment". It must not be possible to turn the ignition switch to LOCK when the selector lever is not in the вЂњPвЂќ position.